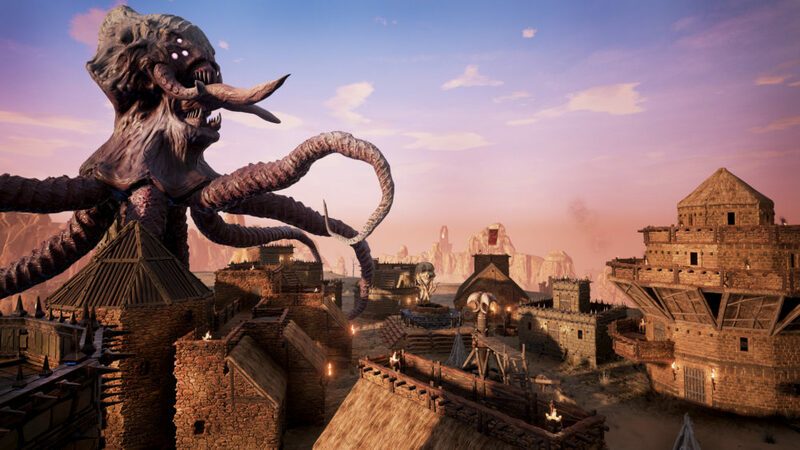 Conan Exiles is a gritty survival game set in a hostile and dangerous world, so you’re going to need to be prepared to use force if you want to get by. But you don’t always want to kill people. Particularly if you’re trying to capture thralls. Here’s how to knock someone out in Conan Exiles. As you might imagine, if you’re wanting to knock out, say, a thrall, you don’t want to be using a sharp or heavy object. No matter how gently you swing an Iron Warhammer, it’s going to split that thrall in half rather than knock him out! Knocking out someone in Conan is really about using the right weapon, and there is only really one weapon for the task: the truncheon. It isn’t honestly all that effective, being slow and requiring that you’re super close to enemies to actually hit them. The trick is to upgrade the truncheon via each tier of the Wheel of Pain, but also upgrade your strength to make each blow more effective. There’s also a mod piece that can be attached for concussive blows, which should make things much easier. There is a high-level mace called the Love Tap that is very effective at knockout out enemies, but it can only be obtained from Legendary Chest so you’ll need to be prepared to put in the hard yards farming for keys from bosses. You can actually knock out enemies using a bow and arrow, by crafting blunt arrows and firing them from a low-level bow. You’ll also need to add a blunt damage upgrade to the bow to make this work. Do be careful not to use a good bow, though, because otherwise, you’ll just end up killing the enemy instead. That’s everything there is to know about how to know someone out in Conan Exiles. For more useful tips and guides on the game, be sure to search Twinfinite.